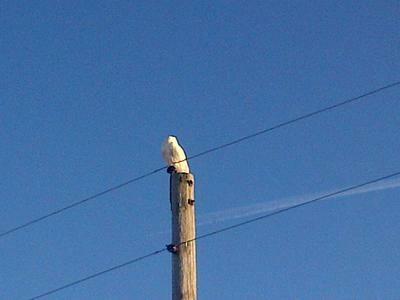 Hi - Driving home just north east of Aylmer, Ontario, I spotted something white at the top of a telephone pole. I had to back up to see this male Snowy Owl sitting atop the pole. Wow, thank you for this picture, Rod, how wonderful for you to see this! I haven't spotted one this winter, but I'll keep looking as we live in St Thomas, perhaps I'll be lucky and see one too! I have also been fortunate to see a Snowy Owl northeast of Aylmer. Both sightings took place this month (February 2014). The Owl flew over the road one morning as I was heading east on Ron McNeil Line. During the evening I saw it again on Hacienda Road near the Ontario Police College. It was sitting on the shoulder of the road, then it flew to the east over the fields. Absolutely awesome! Cool picture, you were lucky to spot the Owl!